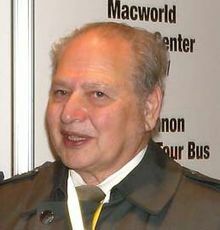 Ronald Wayne (born May 17, 1934) is a retired American electronics industry worker. He co-founded Apple Computer (now Apple Inc.) as a partnership with Steve Wozniak and Steve Jobs, providing administrative oversight and documentation for the new venture. Twelve days later, he sold his 10% share of the new company back to Jobs and Wozniak for US$800, and one year later accepted a final US$1,500 to forfeit any potential future claims against the newly legally incorporated Apple, totaling $2,300, which is equivalent to $10,127 in 2018 after inflation. Ten percent of Apple's $1 trillion market cap in August of 2018 was worth more than $100 billion, which if owned by one person would make them the second-richest person in the world. Wayne was born in Cleveland, Ohio, United States on May 17, 1934. He trained as a technical draftsman at the School of Industrial Art in New York. In 1956, aged 22, he moved to California. In 1971, Wayne started his first business, a company selling slot machines. The company failed, with Wayne reflecting in 2014 that, "I discovered very quickly that I had no business being in business. I was far better working in engineering." In 1976, Ronald Wayne built the internal corporate documentation systems at the three-year-old Atari, where he met coworkers Steve Jobs and Steve Wozniak. To help settle one of their typical intense discussions about the design of computers and the future of the industry, Wayne invited the two to his home to facilitate and advise them. In the ensuing two hour conversation about technology and business, Jobs proposed the founding of a computer company led by him and Wozniak. Those two would each hold a 45% stake so that Wayne could receive a 10% stake to act as a tie-breaker in their decisions. As the venture's self-described "adult in the room" at age 41, Wayne wrote a partnership agreement and the three founded Apple Computer on April 1, 1976. Wayne illustrated the first Apple logo, and wrote the Apple I manual. Wayne's business attitude was already risk-averse due to his experience five years prior with the "very traumatic" failure of his slot machine business, the debt of which he had spent one year voluntarily repaying. Jobs secured a US$15,000 line of credit to buy product materials for Apple's first order which had been placed by The Byte Shop, whose reputation as a notoriously slow paying vendor gave Wayne great concern for his future. Legally, all members of a partnership are personally responsible for any debts incurred by any partner; unlike Jobs and Wozniak, then 21 and 25, Wayne had personal assets that potential creditors could possibly seize. Furthermore, his passion was in original product engineering and in slot machines, and not in the documentation systems he assumed Jobs and Wozniak probably wanted him to do indefinitely at Apple. Believing he was "standing in the shadow of giants" of product design talent and avoiding financial risk, he quit the company. Reportedly, "Twelve days after Wayne wrote the document that formally created Apple, he returned to the registrar's office and renounced his role in the company", therefore relinquishing his equity in exchange for US$800 on April 12, 1976. Wayne has stated in following decades that he does not regret selling his share of the company as he made the "best decision with the information available to me at the time". He said he had originally believed that the Apple enterprise "would be successful, but at the same time there would be significant bumps along the way and I couldn't risk it. I had already had a rather unfortunate business experience before. I was getting too old and those two were whirlwinds. It was like having a tiger by the tail and I couldn't keep up with these guys." In retrospect of Apple having become one of the most valuable companies in the world, he assumed that with the stress of having stayed with Apple since its founding, he "probably would have wound up the richest man in the cemetery." He summarized, "What can I say? You make a decision based on your understanding of the circumstances, and you live with it." After leaving Apple, Wayne resisted Jobs's attempts to get him to return, remaining at Atari until 1978, when he joined Lawrence Livermore National Laboratory and later an electronics company in Salinas, California. In the late 1970s, Wayne had run a stamp shop in Milpitas, California for a short time, Wayne's Philatelics. After a number of break-ins, he moved his stamp operations to Nevada. The logo for the business was a wood-cut style design, with a man sitting under an apple tree, with the "Wayne's Philatelics" name written in a flowing ribbon curved around the tree. This had the same basis as the original logo he designed for Apple Computer. Steve Jobs approached him again as a business contact for Apple, but Wayne refused to even forward Jobs's proposal to purchase a friend's company. Wayne's principle was that his friend should retain ownership under exclusive license to Apple instead of selling, but he would later express regret for having blocked the contact instead of allowing the decision to be made directly. In the early 1990s, Wayne sold the original Apple partnership contract paper, signed in 1976 by Jobs, Wozniak, and himself, for US$500. In 2011, the contract was sold at auction for $1.6 million. Wayne has stated that he regrets that sale. Wayne retired to a mobile home park in Pahrump, Nevada, where he sells stamps and rare coins, and plays penny slots at a casino. Wayne never owned an Apple product until 2011, when he was given an iPad 2 at the Update Conference in Brighton, England. He holds a dozen patents. ...the product of decades of research and observation into the evolution of human governance, and the foundations of the American Constitutional Republic. Through this analysis, the reader is introduced to a complete, yet simplified understanding of the architecture of our Constitution, its foundations, principles, and the essential meaning of its structure all in the context of modern living. He appeared in the documentary Welcome to Macintosh in 2008, where he describes some of his early experiences with Steve Jobs and Steve Wozniak. ^ Martin, Emmie (August 2, 2018). "Apple hit a $1 trillion market cap—here's why its third co-founder sold his 10% stake for $800". CNBC. Retrieved August 2, 2018. ^ "Just nine of the world's richest men have more combined wealth than the poorest 4 billion people". The Independent. Retrieved August 2, 2018. ^ Lee, Dave (April 1, 2016). "Apple at 40: The forgotten founder who gave it all away". BBC News. ^ "Bio". Ronald G Wayne official site. Archived from the original on February 23, 2015. Retrieved September 2, 2015. ^ a b c Dormehl, Luke (December 3, 2014). "The oddly uplifting story of the Apple co-founder who sold his stake for $800". Cult of Mac. ^ a b c d e f g h i Luo, Benny (September 12, 2013). "Ronald Wayne: On Co-founding Apple and Working With Steve Jobs". Nextshark. ^ Isaacson, Walter (2011). Steve Jobs. Simon & Schuster. p. 44. ISBN 978-1451648539. ^ a b c "Pahrump Nevada Man Could Have Been Apple Billionaire now lives in Mobile Home Park". RealPaurump.com. June 25, 2010. Archived from the original on August 28, 2014. Retrieved July 5, 2010. ^ a b c d "Woz, Jobs and ... Wayne? Apple's forgotten founder still wandering in the desert". Mercury News. San Jose, California. June 2, 2010. Archived from the original on June 3, 2010. Twelve days after Wayne wrote the document that formally created Apple, he returned to the registrar's office and renounced his role in the company. When Jobs and Wozniak filed for incorporation a year later, Wayne received a letter asking him to officially forfeit any claims against the company, and he received another check, this time for $1,500. ^ a b "US pensioner Ronald Wayne gave up £15bn slice of Apple". The Daily Telegraph. UK. April 23, 2010. Archived from the original on November 14, 2012. Retrieved September 2, 2015. ^ a b c Wozniak, Steve. "Letters-General Questions Answered". Steve Wozniak official site. Archived from the original on August 17, 2000. ^ Seibold, Chris (April 12, 2009). "April 12, 1976: Ron Wayne, Apple's Third Founder, Quits". Apple Matters. Archived from the original on February 1, 2015. ^ a b Simon, Dan (June 24, 2010). "The gambling man who co-founded Apple and left for $800". CNN. Archived from the original on June 26, 2010. Retrieved June 24, 2010. Wayne left Apple for only $800. "What can I say? You make a decision based on your understanding of the circumstances, and you live with it," he said. ^ a b Linzmayer, Owen W. "Chapter one: The Forgotten Founder". Apple Confidential: The Real Story of Apple Computer, Inc. No Starch Press via The Denver Post. Archived from the original on April 11, 2015. Retrieved March 31, 2010. ^ "Sotheby's listing of the sold item". Sotheby's. ^ Blackden, Richard (December 13, 2011). "Apple's founding document sold for $1.59m at auction". The Daily Telegraph. Archived from the original on February 24, 2016. ^ Newman, Bruce (June 9, 2010). "For obscure Apple co-founder, misstep was a costly one". The Seattle Times. Archived from the original on August 31, 2011. ^ Brian, Matt (September 11, 2011). "Apple's co-founder Ron Wayne on its genesis, his exit and the company's future". The Next Web. Retrieved September 13, 2011. ^ John C Abell (June 3, 2010). "Apple Co-Founder Ron Wayne's Long, Strange – and Sad – Trip". Wired. Archived from the original on October 27, 2014. Retrieved November 11, 2010. ^ a b "Adventures of an Apple Founder on iTunes store". Ronald G Wayne. September 3, 2011. Archived from the original on October 1, 2011. Retrieved November 11, 2010. ^ 512k Entertainment (January 1, 2008). "Life Before Apple". Archived from the original on September 2, 2015. This page was last edited on 17 April 2019, at 00:30 (UTC).